If you read my earlier posts you know that I had a little blog contest to give away a duplicate knitting book that I had. Jen, I'm mailing it out to you today. Well, Jen isn't the only winner. I, too, won a blog contest. That's what I call good karma! This one was hosted by Canadian Living magazine on The Craft Blog. By the way, they have other excellent blogs as well. This is one of my favorite magazines and websites. They have some really nice free patterns, great and reliable recipes and interesting stories. So, what did I win? 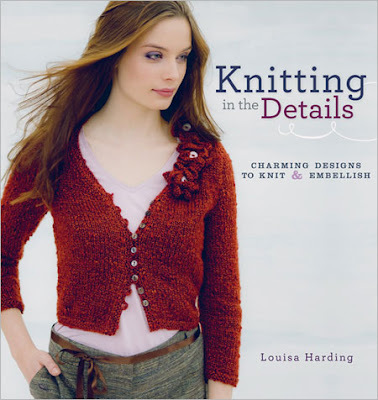 Yesterday I received the book by Louisa Harding, "Knitting in the Details". So far I've only had a chance to skim through the book, but my first impression is that the book is lovely. The patterns are very feminine. While I might not make some of the designs exactly as they appear in the book (they are a bit young for me), they do stir the creative juices and I would use some of the ideas and techniques and fly with them. I particularly like the sweaters, and the little embellishments are inspirational. There are lots of small projects such as handwarmers, scarves and hats that would make good last-minute gifts. A funny side note: When I looked at the back of the book I saw that it was published by Interweave. The book was mailed from Etobicoke, Ontario (near Toronto) to me here in Colorado. Interweave is also in Colorado, in Loveland, roughly 70 miles away from where I live. The book has pretty-much made a round trip. Cool!